Posted by Cora Hall on April 10, 2019 in Hockey, Sports, Top Stories. There’s no perfect formula to building a dynasty. There’s no guide on how to recruit players or how to make a national championship run. 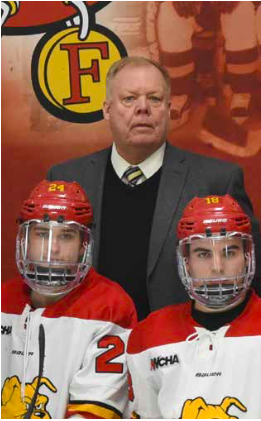 But Ferris hockey head coach Bob Daniels figured it out in his 27-year tenure. Daniels and the Bulldogs have won three regular season championships, a conference tournament championship, made it to the NCAA Elite Eight three times and the NCAA Championship once in 2012. Daniels was named National Coach of the Year twice and conference coach of the year three times, and holds a current record of 454-489-104. Daniels said his coach at Michigan State University (MSU), Ron Mason, was his example of legendary coaching. The Livonia native will be the first to tell you that he wasn’t a great player and will make a wise-crack about his skills on the ice. But Daniels knew all along he wanted to be a coach and was always intrigued by the coaching side of the game. Anyone who knows Daniels, though, will tell you right away that it’s about more than hockey for him. Former Ferris hockey player Chad McDonald, who played forward from 2013-17 and now plays for the Kalamazoo Wings, can attest to Daniels’ investment in his players. Former Ferris hockey player Simon Denis, who was a defenseman from 2011-16, said Daniels’ attitude toward personal growth was evident from the very beginning on his official visit. There is a fine line in the player-coach relationship for Daniels, though. Walls have to be put up, which is something that does not come naturally for him. However, Daniels was adamant that while players are on the team, they can’t exactly be his best friends. For many players, that switch flips right away. McDonald said right after his senior season, he sat in his coach’s office talking about everything from Daniels’ daughter going to dental school to what his future plans were, topics that wouldn’t have necessarily surfaced when he was a player. However, Daniels’ career has not been without its trials, the hardest coming from his personal life. When asked about the biggest challenged he’s faced, Daniels responded with a heavy sigh. April 13, 2018, Daniels’ wife, Leslie Daniels, passed away after a two-year long fight with cancer. It shook the Bulldog community, as Leslie was deeply involved at Ferris. “My wife passed away, did you know that? In April and…” Daniels paused, choking up. “During that time period, you cannot … you don’t pay the attention to the program that the program deserves and you feel like you’re not paying attention to your wife’s needs that she deserves. It’s just tough,” Daniels said. The Daniels family received a flood of support during the difficult time, and some might consider those community bonds to be the true dynasty Daniels built. It was one of the times he said he was grateful they never left Big Rapids because they were surrounded by those who would support them in their time of need. Many former players attended the service, including McDonald, who said it showed how much of an impact Daniels has on his players. During that time, though, Daniels said his relationships with his current players became somewhat distant. “It was very difficult and I kind of lost contact a little bit with our players because as soon as practice was over — I missed a lot of practices — as soon as practice was over I had other duties. I had other responsibilities. I couldn’t just hang around the rink and get to know [the players]. Our sophomores this year, I really didn’t have a great relationship with them, not that I had a bad one, I was this guy that popped in and out of here,” Daniels said. But when his players rallied around him in his hardship, it was in return of the numerous times Daniels helped them in their own challenges. McDonald saw this twice in his career at Ferris, suffering a shoulder injury his sophomore year and an elbow injury his junior year. McDonald said right after he separated his shoulder, Daniels came in the locker room with him in the middle of the games to tell him it was going to be all right. Denis, who went on to play professionally and just finished his first season with the Daemyung Killer Whales in South Korea, suffered one of the more severe injuries Daniels probably saw. After an awkward collision ended with another player landing on Denis’ head in 2013, he suffered fractures in his C5 and C6 vertebrae. Doctors told Denis it was a miracle he wasn’t paralyzed from an injury that can even be fatal. Looking back, Denis said it still blows his mind that it happened. On the other side of things, Denis and McDonald both said Daniels looked for the humor in most situations and would be the first to crack a joke. Daniels may be an emotional man, but over the years, he has learned to reign in the emotion, and Denis said he always kept a level head. Sometimes a good yelling was warranted, but Daniels demands much of his players and knows how to get the best out of them, according to Denis. Reflecting on his tournament runs, though, Daniels is less level-headed and will openly admit he’ll always be upset about his 2003 team losing in the Elite Eight to Minnesota at their campus. “I still feel to this day that team got ripped off. Because I think our two teams should have met in the finals, Minnesota and us, and it should have been on a neutral site. I’m still frosted, I’ll never forgive how that all came down. But back then, that was our first trip so I was just happy to be there, but I get more bitter as the years go on about that, I do, I’m bitter. It’s awful,” Daniels said, all while laughing. Daniels’ most historic run by far was the 2012 run all the way to the national championship, although ultimately Ferris lost and were national runners-up. In the moment, Daniels said winning a national championship wasn’t even on his mind going into the tournament. Something Daniels didn’t foresee at the beginning of his career that he said he will always cherish is spending time with his players. For him, working with college kids is the “most rewarding” and it does not even feel like a job to him. “When I first came out and was coaching, I thought I knew it all and I couldn’t have been more wrong,” Daniels said. “I think it really is important, though, that when you build a program, that it’s not just based on your on-field, on-ice accomplishments, that there’s so many more accomplishments. Right now, I have three players that are pre-med. I’m as excited about that as I am about anything on the ice. I’m amazed that they can juggle the athletics with pre-med and that bio-chem. That’s a tough track, that’s a hard, hard degree and I’m just in awe.